The Jasper County Sheriff’s Office says a man from Carthage was arrested for making a bomb threat. Investigators say the suspect called in the threat to Webb City High School on Friday. Deputies say a passenger in a vehicle that was stopped was the one that called in the threat. The school was checked and cleared by the Webb City Police Department. The man, who made the threat, is in the Jasper County jail awaiting formal charges. At approximately 4:04 PM, 11-16-18, a Jasper County Deputy made a traffic stop just east of Webb City. 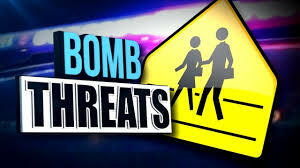 While the deputy was investigating the traffic violation, a bomb threat was called in to the Webb City High School. It was quickly determined that the passenger in the vehicle that the deputy had stopped was the one that called in the bomb threat in an effort to get the deputy to leave the car stop and avoid the traffic ticket. The suspect was arrested for making terroristic threats and was transported to the Jasper County Jail where he will be held pending the filing of formal charges. The school was checked and cleared by the Webb City Police Department and it was determined there was no threat.